After inviting all of your family and friends to an event such as a birthday party it’s natural if to feel too much pressure to make it a success. So, if you really want your parties to be memorable then you have to give your guests reasons to talk about it for a long time. Coming up with innovative ideas for an interesting party can be tough if you are not aware of all the options and choices that you have, especially when it comes to food. This is why entrusting a reputed catering service to plan and arrange food for your party is a wise decision. When you are organising a party making sure of every tiny little detail can be overwhelming. The constraints of time and direction can often cause a mess at the last moment. Delegating the job of arranging and managing the perfect party will allow you to ensure that your guests have an exceptional time at a great party. 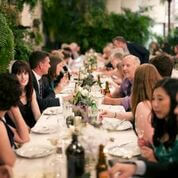 Starting from an idyllic venue to an interesting theme and delicious meal, you cannot miss out anything. Some of the ways to ensure that people have a wonderful time at your party involve basic tactics. First of all, ensure that quality is your priority. Choosing quality over quantity will allow you to create a lasting impression on your guests. If instead of having three average welcome drinks, you can have a single exceptional one – your purpose is accomplished and that too with ease. Experts in the business are aware of what themes will be a standout choice for your party. If you have any suggestions or preferences of your own then it is even better as their guidance can help you materialise your dream arrangement. Themes should be selected as per the event. If you are opting for birthday party catering Melbourne has many popular themes like Harry Potter or Disney Princesses for kids, or a Game of Thrones or Beach Theme for adults is a good idea. Apart from birthday catering Melbourne, you can also arrange for a range of activities to keep the guests engaged and entertained. You can think of a special act by a cartoonist, magician or musician. You can also hire an adult stand-up comedian to spice up the event. Add a Karaoke machine for the adults to indulge. The crucial thing about the success of any party is also a great guest list. If you keep it short, you will have more time to interact with people one on one. It gives you an opportunity to personally see to it that everyone is having fun. And also, the lesser people you have to impress the better it is for you. Everything about your party has to be simply perfect. What you can do is be exceptional when it comes to planning for trendy themes, popular dishes, beautiful venues and other additional attractions. There are huge possibilities when it comes to everything you can do at a party and catering services ensure that the options are judiciously exploited.